Past Designs has been honored to work with historic preservation planning teams to rejuvenate some of America's most treasured historic sites. From large estates to small New England village lots, our historic preservation planning has preserved these landscape legacies using the most up to date preservation policies and technologies. 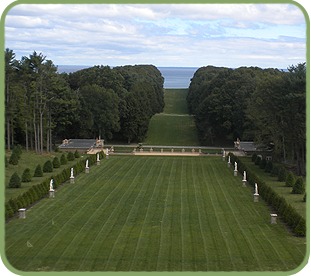 Our historic garden designs have rejuvenated the work of such notables as Marion Cruger Coffin, Arthur Shurcliff, Fletcher Steele, Ogden Codman, Ernest Bowditch, the Olmsted Brothers and numerous nineteenth century professional gardener/designers. By understanding the past, assessing the present needs of the institution, and building a vision for the future, we can manage the ever-changing dynamics of the historic preservation planning process to revitalize its soul for future generations. Our preservation efforts have won the recognition of several notable local and national organizations including: The Garden Club of America, the American Society of Landscape Architects, the Massachusetts Historic Preservation Commission, the Preservation League of New York State, the State of New Jersey Historic Preservation Commission, the Massachusetts Historic Commission, the Newport Historical Society, and Blithcwold Mansion, Gardens and Arboretum.